Are you in Newcastle upon Tyne on Saturday? 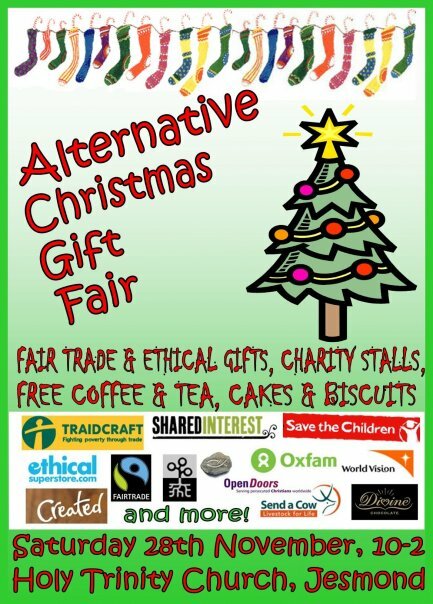 If you are, we’d love you to come down and meet us at the Alternative Christmas Gift Fair – it’s the perfect opportunity to say hello to the EthicalSuperstore team and take a look at some of our top Christmas gift ideas. We’ll be at the Holy Trinity Church in Jesmond between 10am-2pm (Churchill Road, just next to the Armstrong Bridge, by Cradlewell). Pop along and hi, enjoy a cup of fairtrade tea or coffee, and peruse our gifts, cards and eco-friendly gadgets. Our challenge is to solve all of your Christmas present dilemmas in one swoop! There’ll be plenty of other stalls there too, including Traidcraft, People Tree and Divine Chocolate. We hope to see you there! Get stuff, give stuff, save the planet. Next story Make Your Own Christmas Decoration!